Managing payroll can be a daunting task. Calculating the deductions for all your employees can be extraordinarily time consuming, especially if there’s a large number of employees on the payroll. An Excel payroll calculator template can be just what someone in charge of payroll operations needs. This easy-to-use calculator can save time, energy, and in the long run, even money. The first step in using the calculator is to input the employee identification number and the employee’s name. Next, type in how much the employee makes per hour. Then it’s time to input all the tax information, including the status, allowance, and the percentage taken out in state, federal, social security and Medicare tax. These percentages will all be calculated automatically to reveal how much in total taxes each employee is paying. Finally, it’s time to input how much an employee is deducted for insurance or any other regular deductions. These deductions will be input in dollars rather than in percentages. The total number of deductions in dollars will automatically be calculated in the final column. As presently designed, the calculator is set up for up to 25 employees. However, the template is completely customizable, so you can add or remove employees as you need to. You can also change the color scheme and add your company logo if you need to present the spreadsheet to others. Categories and columns can also be added and removed as necessary. Those looking to streamline the payroll process can do so quickly and easily with this complimentary calculator. 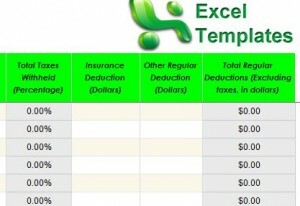 It’s just one of hundreds of free Excel templates and spreadsheets available on this site.